Many books are no longer in print these days and all of the following are limited to stock on hand. We are unable to obtain more. If you were looking for holiday ideas, these are the best resources, and they won't be here for long! by Elaine Fossler presents twelve charming new holiday designs that will fill your home with the Spirit of Christmas. Includes 4 small window panels that can be hung or displayed in stands, along with 3-dimensional projects for lighted a Christmas tree, angel tree toppers, and Santa in his sleigh being pulled by a flying reindeer, Nativity nightlight, fireplace candleholder, Santa cardholder and Christmas package napkin holder. Instructions and color photos are included for every project. You get 44 pages of Christmas designs that include hanging decorations, stand up scenes and dimensional pieces. This is an "oldie but goodie" that has been a best seller for 15+ years. by Liz Leopold features nicely designed picture frames, jewelry boxes and shadow boxes to display your precious treasures. Complete instructions, full– size patterns and an attention to the little details make this a very worthwhile book. 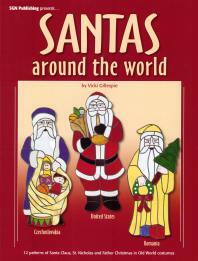 SANTAS AROUND THE WORLD (#14852) by Vickie Gillespie has 12 full size patterns of Santa as he is seen in various countries around the world. Every country has a variation on the St. Nicholas theme and Vickie has done up lovely renditions in the old world style. Russia, Germany, Austria, England, Poland and the USA are represented as well as six others. All are shown in full color. 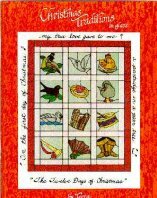 This is one Christmas book that you will bring out every fall to work on a different Santa project.